TechCash is the university's campus-card program in which you can store funds on your HawkCard ID for on-campus spending. Family and friends can make deposits for you online using your CWID number. Access, Card, and Parking Services is pleased to introduce a new mobile-friendly TechCash Management Site, GET! 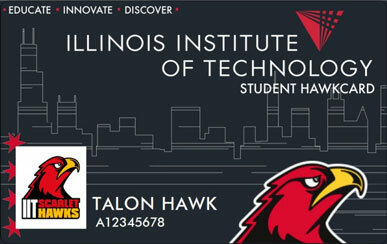 by CBORD, Inc. Visit GET!-MyHawkCard Online 24/7 to add TechCash to your HawkCard. TechCash funds will be available for spending immediately. A $1 convenience fee applies. VanderCook Students: Online TechCash account management is not available at this time. TechCash deposits can be made through GET!-MyHawkCard Online using the guest deposit feature. Account balances may be requested at Illinois Tech Dining locations, the ACaPS Office, or by tapping your HawkCard at any vending machine with a TechCash reader. TechCash deposits can also be made by electronic check via the ACaPS Store. No convenience fee applies. Students, faculty, and staff may request refunds of balances greater than $10.00 upon official separation from the university. Refunds may not be granted otherwise.